By now, you’ve probably heard all the hype about virtual reality (VR). So what is it really, except a manipulation of your senses? 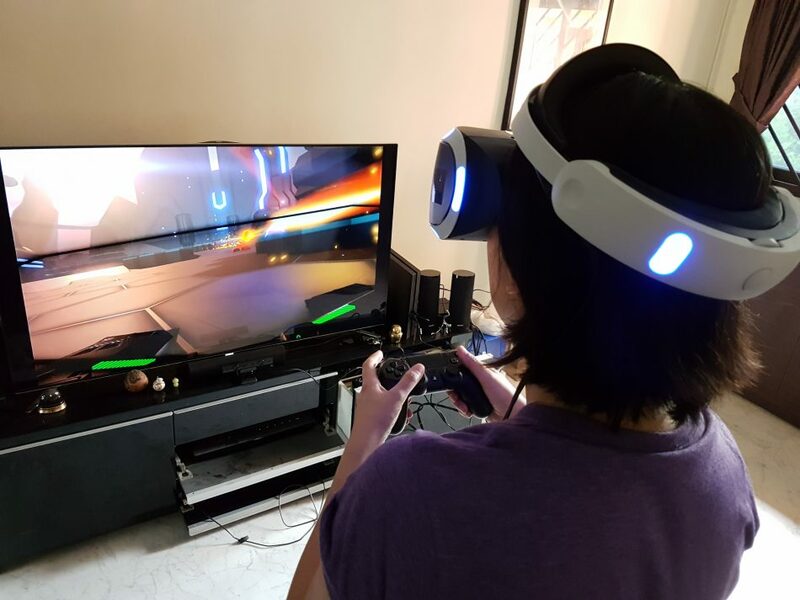 I had the opportunity to try out the newly launched Sony PlayStation VR (PS VR) system in my living room recently, and boy, I didn’t think messing around with my senses can be this much fun. Check out the stuff that came in the box! The two Move motion controllers are not part of the package – these need to be bought separately. 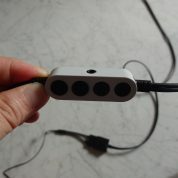 There is quite a bit of setting up to be done, what with the camera, the headset and the many cables, but the instructions are idiot-proof and the cables clearly numbered, so I managed to connect everything in about 30 minutes. 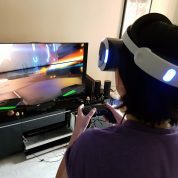 I got the PS VR working in my living room, which measures about 2.2m from where I sit on the couch to the PS Camera in front of my TV set. The great thing is that the PS VR works fine in small spaces, which is the case for most homes in Singapore. Some games do require some clear space around you to play so if you are in a really tight space, you might need to move some stuff. 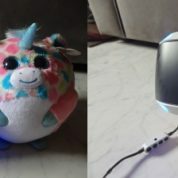 It is also good to have someone else with you to help in the setup to remove any obstacles around you or adjust the camera since you can’t see the real world with the headset on. The VR headset with its cool blue lighting was quite a sight to behold when lit. 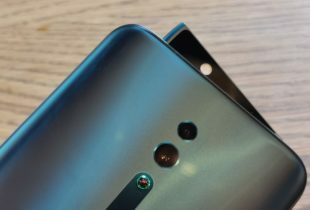 It reminds me of characters in Wall-E – from the inside, where I thought it looked like Wall-E’s eyes, to the outside, which looks a lot like his friend Eve with the blue glowing eyes. At about 600g, with soft padding on the forehead and supports on the face, the headset was comfortable enough to wear for hours of gameplay. The scopes and the headband are also adjustable so it should fit most heads comfortably. 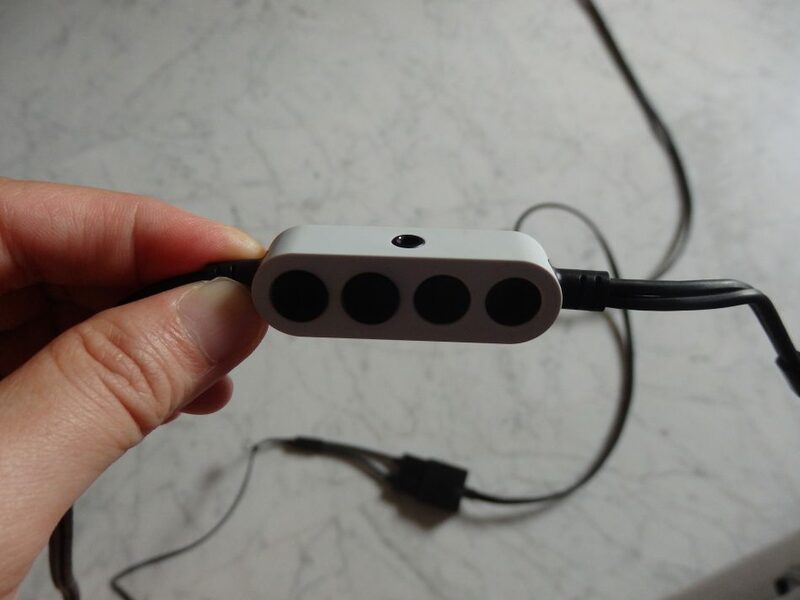 The headset measures approximately 187×185×277 mm (width × height × length), with the headband at the shortest. The biggest problem for me was how hot and sweaty my face felt under it in Singapore’s humid climate. For gamers with long fringes, do push up your hair with a hairband, otherwise you’ll end up having hair and sweat in your eyes while playing. I keep a clean microfibre cloth handy to clean the lenses as they can get smeared after long gaming session. 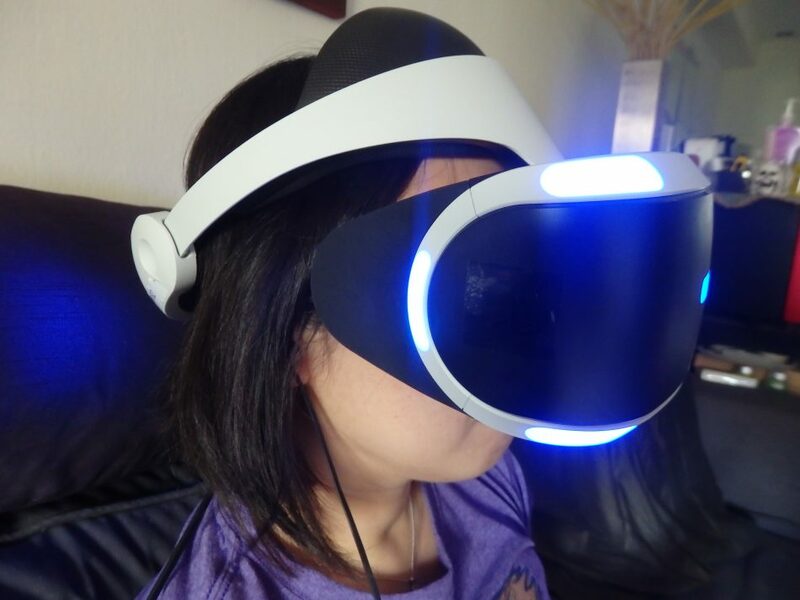 The PS VR headset can be adjusted to fit most heads. One minor annoyance with the VR headset is the cable that dangles down the headset to connect to the PS4 console. My unseeing arms catch it at times. During my tests, I had to resort to pinning it down with my back on the couch though I could still feel it on my shoulder. This cable also feeds the headset its power, lets you change the volume and even hook up in-ear earphones for a truly immersive experience. For me, I prefer to listen to the audio from my sound system without more wires hanging around. Used independently from the TV screen with the earphones, the VR headset can technically let someone else watch TV next to you. Just make sure you don’t accidentally hit him/her when you are enthusiastically swinging the controllers around since you can’t see the real world. Or you can leave the TV connected to your PS4 so that the others can see what you are seeing on screen and enjoy the game with you. Nifty. Calibration is very important for a satisfactory gaming experience, so take some time to get it right with the camera, VR headset and the controllers. Some games took me a few attempts to get it right, like the demo game Job Simulator. It had me trying to put a mug into a coffee machine behind me and I ended up knocking my cushions off the back of my couch. Somehow the coffee machine was situated behind the wall so there was no way I could reach it. I had to restart the game and calibrate a second time. Then I ended up sitting on the floor in the game and I couldn’t even reach for the mug. So it was back to calibration again until things finally worked out. 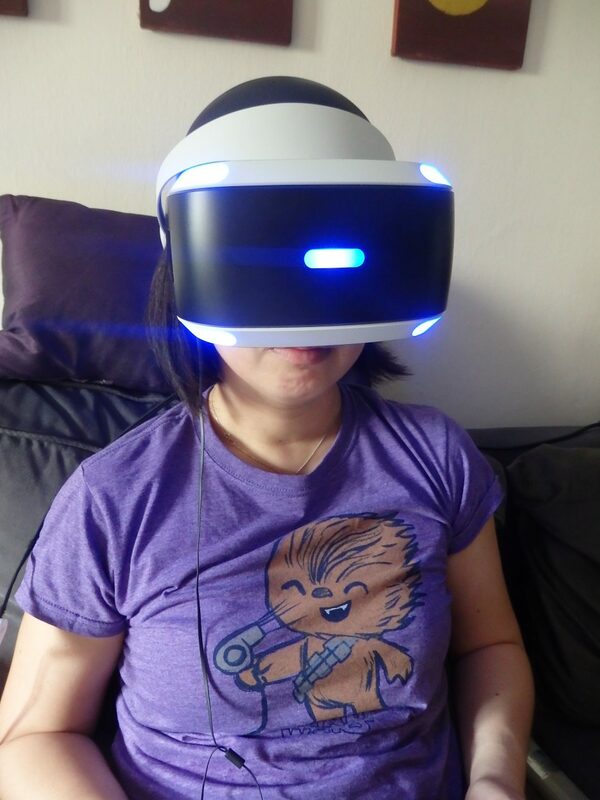 Good news is, once you’re all set, the PS VR offers a great experience! Lost in motion – the PS VR looks huge on my face but fits comfortably. 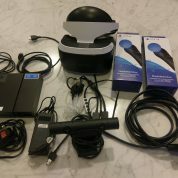 With the PS VR set comes a demo disc with a good variety of games that showcase the fun and innovative ways that the VR set can be used. 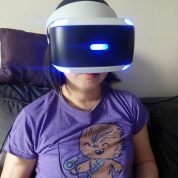 The regular PS DualShock controllers can play most VR games just fine. And it’s not just pressing buttons to control the game, the very movement of the controller is also part of the gaming experience. You can use the controller that is seen floating in the virtual space to hit a virtual ball and the vibration makes you feel like you really did strike something. It’s brilliantly designed to make the virtual more of a reality. However, if you can acquire a pair of PS Move motion controllers, they can really enhance the VR experience, especially for games that involve virtual hands, such as shooting and manipulation of objects. 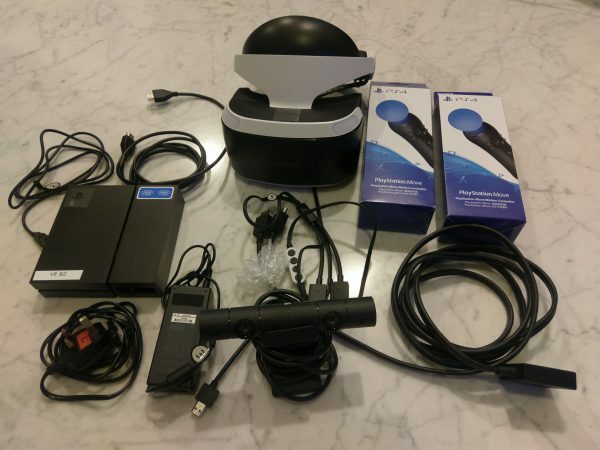 The Move motion controllers have been around for a while since the days of the PS3, so if you have them stashed away somewhere, this is a great way to put them into good use. You can leave the TV on so others around you can see the game through your eyes! Some demos that work well with the Move motion controllers include the hilarious Job Simulator game, where you use the Move controllers to control the hands of of a desk bound worker who needs to grab a mug, operate a coffee machine and drink it before starting work. I enjoyed being completely insubordinate and picking things up to throw at the computer “boss” giving me orders. Games that involve shooting like London Heist, God-like manipulation of objects like O! My Genesis, and pointing and grabbing of virtual objects like Wayward Sky were a lot of fun to play and I can see myself going at them for hours. These games really blend the VR concept and controllers brilliantly. Even the headset is used to interact with objects in the game – you can use it to aim, respond by nodding and even head soccer balls into goals, like in the Headmaster game in the demo disc, except you don’t feel any vibrations on your head. 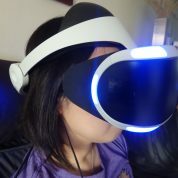 Some fast-paced games such as racing and first-person shooting games, which were traditionally my favourites, made me feel the effects of VR gaming. After playing a few minutes of the VR Battlezone, a tank shooter, I felt a little dizzy since there was a lot of quick swivels and aiming up and down. But it was not as bad as playing the fast paced racing game DriveClub VR where somehow my head could not reconcile with the virtual reality racing and I had to stop before nausea hit. And bouncing around shooting at robots in RIGS Mechanized Combat League really did a turn on my stomach. Guess some of us need more time or seasick aids to get used to VR motion. Sadly, the demo disc for Asia doesn’t have some of the titles in the US version that I was dying to try, like Resident Evil 7 Biohazard: Kitchen, Until Dawn: Rush of Blood and EVE: Valkyrie. Check out the full list of the games on the Asia demo disc here. Another free VR game that you can download from the PlayStation Store is The Playroom VR featuring cute VR Bots! The PS VR set with the PS Camera retails at S$649. If you already have the PS Camera with your PS4, you can get just the VR headset at S$599. Do note that you will need the PS Camera in order for the VR headset to work – you cannot use the PlayStation Eye from the PS 3 for PS VR. 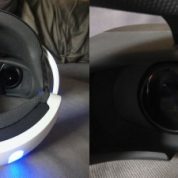 For now, this is probably the most price friendly and accessible option for VR gaming. Other VR headsets, like the Oculus Rift which costs US$599 (S$830) and HTC Vive at US$799, are more expensive. Plus, they are not retailing or shipping directly here so it involves a bit of hassle acquiring them even if you have the dough. 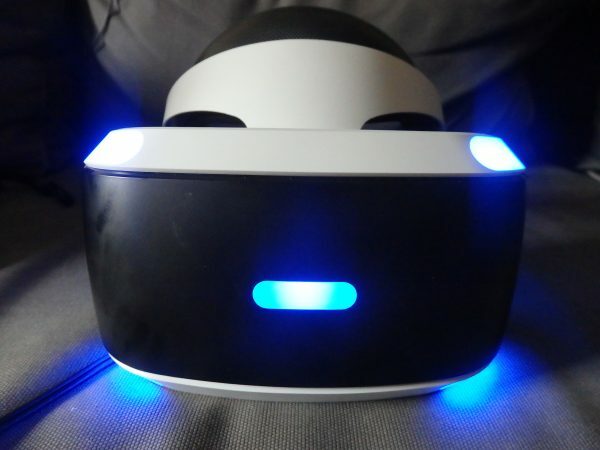 If you already have a PS4 and love PS games, the PS VR system is a good option for getting into VR gaming. Check out the titles and price of PS VR games currently available here. 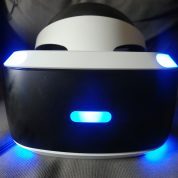 In the meantime, for those who are planning to get PS VR, my advice for those new to VR gaming is to go slowly into games that involve racing, dog-fighting and bouncing around. Your stomach can thank me later.